The term “dissipation loss” can be found in the data sheet for a pressure sensor or pressure transmitter. One needs this specification in order to be able to protect the pressure sensor from overheating. If a pressure sensor is operated in a hot environment, it can be necessary to limit its electrical power. If one neglects this aspect, one possibly risks an overheating and with this, in the worst case, a total failure of the instrument. So how can the correct electrical connection be managed? First, the maximum permissible electrical power for the pressure sensor must be known. This is given in the data sheet as the dissipation loss. Please note that the dissipation loss can be dependent upon the maximum expected operating temperature of the instrument and must be calculated where necessary. The maximum electrical power for the pressure transmitter (PPressure transmitter), which is now known, must be smaller than the permissible dissipation loss. If this is the case, both the power supply (UVoltage source) and the load (RLoad) were properly calculated and the electrical power of the pressure sensor will be within the permissible range under all operating conditions. 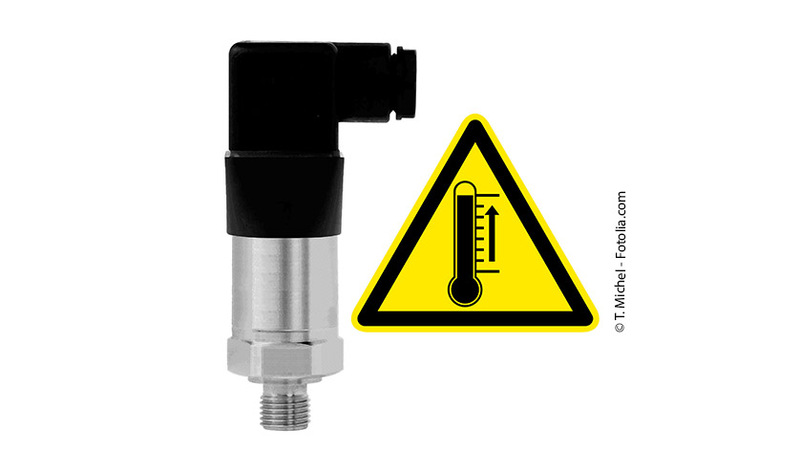 Consequently, the pressure transmitter will not heat too strongly and will withstand the required operating temperatures. Should you need any advice, your contact will gladly help you.